Allardice played one game for Canterbury in the ITM Cup - After finishing his degree he moved to Hawke's Bay where he played in every game of the 2013 ITM Cup and continued his fine form in 2014 as the favorite lock for the Magpies. In 2015 he earned a Chiefs call up for the Super Rugby season. Taihape-born Allardice made his Super Rugby debut for the Chiefs in 2015. The hardworking 25-year-old has shown his resilience in the last 12 months working his way back from a knee injury which has limited his playing time. A product of Palmerston North Boys High School, Allardice was a member of the New Zealand Schools and New Zealand University teams. The Hawke’s Bay Mitre 10 Cup representative has 18 caps to his name. Allardice's debut Super Rugby season was hindered through injury, he was still able to make 7 appearances for the Chiefs. In the 2016 he once again had injury problems that cut his Super Rugby appearances down to 10. In March 2017, Allardice signed on with the Chiefs through to 2018. 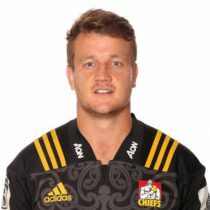 Allardice made 3 appearances for the Chiefs in 2017 and was once again named in the Chiefs 2018 Super Rugby squad.